The government today agreed to implement a wide range of policy measures to address the current economic challenges facing the country following an emergency Cabinet meeting this morning at State House. It would be recalled that on March 9, 2016, President Dr Ernest Bai Koroma established a Cabinet Subcommittee to proffer short to medium term measures on expenditure rationalization and domestic revenue mobilization. The subcommittee comprised the Attorney General and Minister of Justice, the Chief of Staff in the Office of the President, Minister of Finance and Economic Development (MoFED), Minister of State 1, MoFED, Secretary to the President, and Governor and Deputy Governor of the Central Bank. The subcommittee was charged with the specific responsibility to address challenges facing the economy ranging from impact of low commodity prices on minerals, overall low compliance rate among individual taxpaying public and business entities, the effect of the Ebola epidemic, depreciation of the Leone against major foreign currencies, high interest rates and domestic borrowing, increasing trend of extra-budgetary expenditures as well as off budget revenues held by subvented agencies. President Koroma told his Cabinet this morning: “These measures will be implemented up to the first half of 2017 in order to stabilize the current situation.” He urged the Ministry of Information and Communications to sensitize the public of these measures or any actions thereof and to fully engage Civil Society Organizations to be part of the process. “If we are able to fight Ebola, we should be able to put up a fight that would turn around the economic fortunes of the country,” he said. The president expressed the need to take an inward look under the current circumstances on domestic revenue mobilization, and urged MDAs to cut down on expenditure and focus on measures that would be fully implemented in stabilizing the economy. “While considering the recommendations put forward by the International Monetary Fund, We must look at practical ways to minimize the challenges facing the country,” he emphasized. 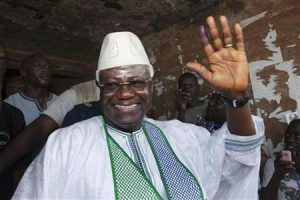 According to the Accountant General, Kebbay Koroma, petroleum retail prices in Sierra Leone are substantially lower compared to neighbouring countries and in effect government is subsidizing the consumption of petroleum products not only in Sierra Leone but in neighbouring countries. · Eliminate double payments of pensions and salaries across the board. The above measures have been extended to March, 2017. · Minimize discretionary duty waivers and rationalize statutory duty waivers. High-level corruption falls under the purview of the ACC and the office of the auditor general. In February, the auditor general reported that the government could not account for a large portion of funds allocated to combatting Ebola, prompting the ACC to launch an investigation within days. Over the course of the year, the ACC initiated additional inquiries into government procurement practices and several ministries over other suspected abuses. The media widely publicized these investigations, which some perceived as a signal of the ACC’s ability to function independently. However, the commission has faced criticism for botched investigations and unsuccessful prosecutions, especially in trials involving the president’s friends, family, and allies.